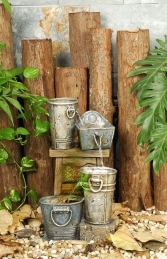 Our medium size rustic wood and leaf motif cascade is a fabulous water feature filled with detail. 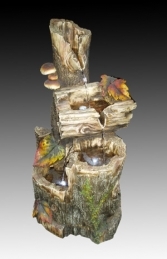 This fountain is ideal for indoor use and will add interest to any setting. 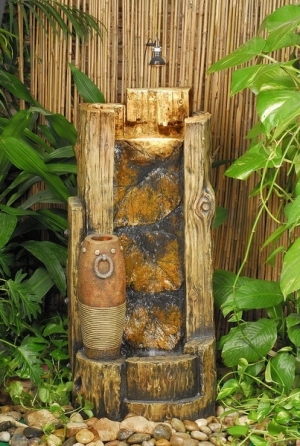 A super water feature fountain with water cascading down over a carved leaf effect panel. Just plug in and add water! All our fountains are made of durable poly-resin; the internal water pump is fully concealed by the 3d modelling (with an access panel) and come fitted with a standard 3point electrical plug. 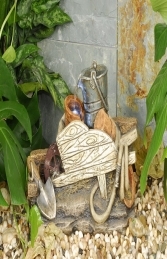 Our range of fantastically detailed poly resin Fountains and Water Features are ideal for themed areas, advertising or drawing attention to your business. They can be used in any themed area, or in shops, businesses, pubs, restaurants, coffee shops, adventure golf courses, zoos, theme parks or even in your own home.